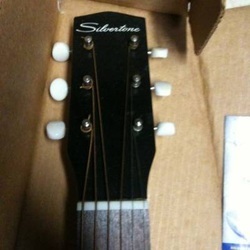 Silvertone brand guitars & picks(1941-1970) were a brand of Sears & Roebuck. In 1940, Kay-made archtops and lap steel guitars bore the Silvertone brand name. The Canadian band, Chad Allen and The Silvertones(later known as The Guess Who) took their name from Silvertone's brand name. Red Silvertone vintage-style pick card.